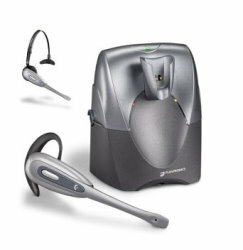 CS55 Wireless Office Headset System - Headsets Direct, Inc. The Plantronics CS55 Headset is the first in the United States to implement DECT 1.9 GHZ Voice-Dedicated wireless Technology. You can receive calls up to 300 feet from a desk phone, talk and get coffee all at the same time! The CS55 has superior quality, secure communication voice dedicated provides uncompromised audio quality and the lowest probability of interference. The CS55 allows 10 hours of talk time and has a remote answering option. The noise cancelling mircophone is perfect for any work environment and drownds out the background noise so your caller can hear you more clearly.